*I have to brag about my creative little Mason. 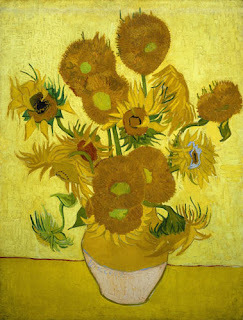 First, look at his watercolor tribute to Vincent Van Gogh's "Sunflowers". When he presented it to me, He said "Mom, I know he's your favorite artist, so I had to paint this for you". What a sweetie! I framed it and it hangs in my studio. *Yes, I need a new camera!!! Just found your blog, and love it! Your son's watercolor is awesome....He has quite a lot of talent! Thanks for sharing. Paige - The onesie dress is adorable! I will have to take a closer look at one of them so I can make some too! What a sweet boy you have. So glad I found your blog - thanks for visiting mine!